Apart from this gigantic natural landscape, Uthaithani also has pride of its local art, culture, lifestyles, traditions and festivals; ranging from the Tevo festival and the prehistoric paintings to the charming monasteries with elaborate architecture. 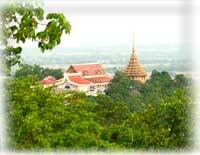 Located 180 kilometers north of the capital city, Uthaithani can be simply reached by car. This is nearly beyond imagination how a perfect sanctuary is lying there awaiting nature-lovers to visit. 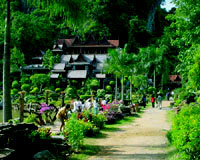 As certified by UNESCO, this Huay Kha Khaeng Natural Wildlife sanctuary is about 1,737,587 rai. 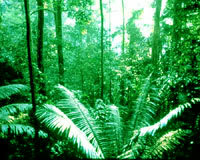 This area contains various classifications of biosphere exist. Marvelous rare wildlife, namely: particular species of wild orchids as well as particular wild animals like buffaloes, tapirs, and hornbills can possibly be found in this sanctuary. 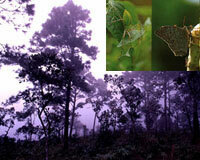 This includes the various botany botany species which outnumber those in European forests. This event is organized during 8-9 December annually and the purpose is to concern environmental awareness for our generantion. 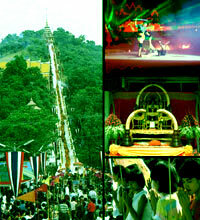 UNESCO registered Huay Kha Khaeng as one of the the world’s natural heritages on 13 December 1991, therefore, the Thai Cabinet decided on December 9 as the Memorial Day for Huay Kha Khaeng- Thung Yai Naresuan Sanctuary. The special activities are include camping, forest growing to honors His Majesty the King, and parades of wildlife models warning people that they are in danger of extinction. 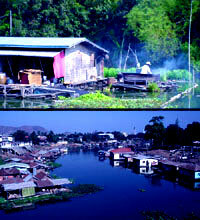 The municipal community itself lies along “the blood vessel of the town” as the Sakaekrang River. Local lifestyle consists of the floating houses along both sides of the river with downtown located on the west bank and the enormous Ko Depo sub-district, the area of orchards and bamboo, lying on the east bank. The inhabitants on the river earn their living by raising fish on their huge floating baskets next to their houses. 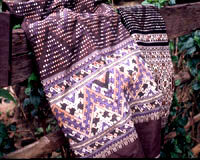 The fish on the farm include the famous Pla Raad (the rhino-fish), Pla Depo and Pla Sawai. One of the most popular preserved fish products is the "golden-brown dry grilled fish" that can make a fascinating souvenir. 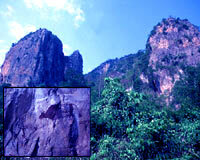 This cave-like valley is situated in Lan Sak District. 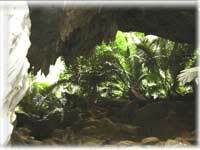 This area consists of ancient times and it is surrounded by rock cliffs. According to the legend, this area was coincidentally discovered by a hunter who was following a goatantelope. 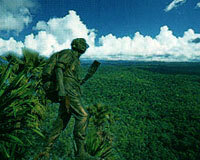 The plain in the middle of the valley was, at that time, covered with a thick forest of large ancient palm trees. At present, some parts of the rocks inside this cavern area have been cut out to make the way through the whole site. This waterfall is located in Huay Kot District. The water flows from Loy Joy stream, on a high mountain in Huay Kha Khaeng sanctuary, making its way down rocky steps and cliffs to make this beautiful waterfall. There are spaces for camps, traits for nature surveys, and nature study center to provide information about this natural heritage. 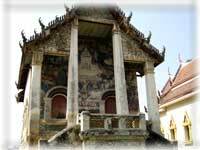 With the reputation of the most attractive monastery in town, Wat Tha Sung is also know as residence of Luang Po Lusi Ling Dam (the black monkey meditating hermit abbot). The compound is made up of a number of glittering buildings of Thai architectural styles one of which is know as Wiharn Kao, the elaborate crystal cathedral houses the fine Buddha image of Pra Buddha Chinaraj on one side, and the wax sculpture of Luang Po Lusi Ling Dam on the other. 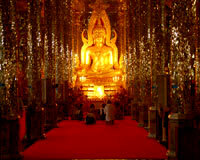 It is believed, according to the Buddhist legend, that Lord Buddha was making his way back to earth at this time of the year after completing his Holy visit to his Holy Goddess Mother on Heaven during the Buddhist Lent. The end of the Lent therefore marks the what so called ‘Devo Lo Ha Na’ conveying the day of the open gate to welcome Lord Buddha back to earth. Devo Festival is usually organized on the first day of waning moon in the 11th Lunar Month (around October) at Wat Sangkas Ratana Kiri. Situated in Ban Rai District, this incredible wooden Thai style building surrounded by attractive flower garden is standing peacefully in a beautiful scenery of natural awaiting visit; no matter they are nature-lovers, art addicts or mind-practice novices. This site is located in the area of Lan Sak District where projecting rocks and hollow cave halls used to be inhabited by ancient people in prehistoric period. It is estimated that the paintings on the cliffs date back to at least 3,000 years in the past. These paintings portray lifestyles of the people, namely: their food, agriculture, farming and religious ceremonies. Uthaithani is famous for its freshwater fish, especially Pla Raad or the rhino fish which taste considerably better than the ones of its kind from any other part of the country. They can be purchased fresh in the market or cooked to a local cuisine in a restaurant. Apart from the fish, we would also like to recommend the crispy fishy-rice cake, the crispy shrimp-flavoured rice chips, the popular heart-stimulant power prepared to the ancestor’s prescription, and the most important souvenir that shouldn’t be left out- the hand-woven cotton or silk cloth with fascinating old-time patterns- this will certainly make an impressive souvenir.